The What: Roland has introduced the V-1SDI Video Switcher, a compact and portable switcher that can accommodate 3G-SDI and HDMI audio/video sources with resolutions up to 1080p and features a host of professional compositing effects and DSK (down-stream key) capabilities. The What Else: The Roland V-1SDI provides switching for professional 3G-SDI cameras and playback sources, along with HDMI sources including cameras, smartphones, computers, tablets, and Blu-ray players. It has two dedicated 3G-SDI inputs, a third channel input that supports 3G-SDI or HDMI, and a fourth channel HDMI input that also includes scaling. Inputs 1 to 3 of the V-1SDI support 1080p/1080i/720p video resolutions with input 4’s scaler supporting a wider range of video and VESA resolutions. This makes the V-1SDI ideal in a variety of configurations for both all-camera applications and applications that mix cameras, video sources and computer data sources. 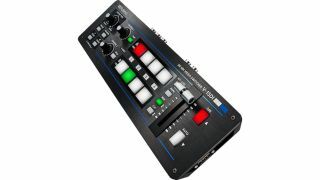 In addition, it has a 14-channel audio mixer for mixing stereo audio from SDI, HDMI, and external stereo audio sources and its dedicated microphone input. The V-1SDI includes two SDI program and preview outputs, an HDMI output, and a stereo audio output. The V-1SDI gives users picture-in-picture and split compositing effects for graphic insets, plus a DSK allowing for switching of input sources underneath overlaid titles and graphics and green screen capabilities. The V-1SDI also has output fade including audio fade-out and auto-scan functions. The 14-channel audio mixer offers three-band parametric EQ, reverb, up to 500ms delay for accurate lip-sync, a compressor/gate on the mic input, and level/multiband EQ on the master mix. A headphone output facilitates audio monitoring, and the V-1SDI supports mono or stereo plug-in-powered microphones. The V-1SDI includes two SDI program and preview outputs, an HDMI output, and a stereo audio output. Both the SDI and HDMI preview outputs can be set to a multiview mode, where all inputs are displayed with colored borders indicating the program and preview selections, or in a full-screen mode. The HDMI multiview output also includes audio metering for the audio sources. In addition, the preview output can be used for additional, menu-driven setup control, or as a second output for applications such as a simultaneous webcast or recording output. The V-1SDI can also be controlled by the companion PC/Mac application when connected by USB, and also has RS-232 for integration in third-party control systems. The Bottom Line: The V-1SDI features a clean, intuitive control layout with multi-function buttons and knobs and a large T-Fader for key and transition operations. It features rugged construction for long-term reliability, even under the most demanding conditions of portable and professional use.